Astrophotographer Anthony Lopez captured this photo of the full moon taken in Juarez, Chihuahua, Mexico on May 26, 2013. Scientists say they now know how the moon got its lemon shape. 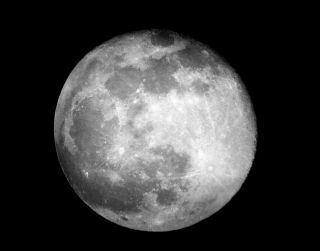 Tidal forces exerted during the early days of the solar system can explain most of the moon's large-scale topography, including its slight lemon shape, reports the study, which was published online today (July 30) in the journal Nature.